Boris JOHNSON is an English politician and the current Mayor of London. His birth name is Alexander Boris de Pfeffel JOHNSON. His mother is Charlotte Offlaw FAWCETT who connects to my paternal FAWCETT family line. Boris is my 5th Cousin, 1x removed. Roy Walter Strong KELLY married my Grand-Aunt Vera Daphne Phyllis McLEAN in 1918 Bathurst NSW Australia. Roy was the Head of the NSW Attorney General's Department between 1945 - 1956. ﻿William Alfred McLEAN ﻿was my Great Grandfather. He was a builder and was involved in many building projects around the Bathurst area in the late 1800s/early 1900s, including the building of the courthouse dome at Bathurst. William lived with his wife, Susannah (nee TOOBY) and his family in Bathurst in the house now known as Miss Traills House. William apparently rented a house out to Ben Chifley (ex-Prime Minister of Australia) in Bathurst before he was Prime Minister. Hon. Ebenezer VICKERY MLC married into my family tree to my 3rd Great Grandaunt, Jane BEGG, in 1851 in Sydney. Ebenezer was born in London in 1827 and arrived in Sydney with his parents in 1833. Ebenezer was very successful financially as a merchant, manufacturer, philanthropist and a politician. He was a member of the NSW Legislative Council, and was a devout Methodist. His residence "Edina" is not the main building of the War Memorial Hospital in Waverley, Sydney. Ethel Louisa BURTON married into my tree to Albert James WHITEHALL, my 1st cousin, 4 times removed. Ethel was the grand niece of Sir Henry PARKES and her mother was Eleanor Louisa PARKES. Joyce Winifred VICKERY was my second cousin, 3 x removed. Joyce connects to my 4th Great Grandfather, George BEGG and is the granddaughter of Ebenezer VICKERY. Joyce was born in 1908 in Sydney and died in 1979. Joyce was a forensic botanist who was most noted for her work on the kidnap and murder case of Graham Thorne in 1960. The successful conviction of the culprit was based largely on her analysis of crime scene plant matter and soil. 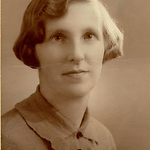 Joyce Vickery was the first female researcher appointed to the New South Wales Herbarium. Many of her taxonomic correspondences between 1935 and 1972 are housed at the Royal Botanic Gardens, New South Wales.